AnonymousVPN is going to be the star of today’s review and I’ve got to say, attempting to find this provider on various search engines can prove to be difficult sometimes, thanks to its generic name that’s often used to describe a trait rather than be set as a title. But you don’t have to take my word for it. Try googling “AnonymousVPN” or “Anonymous VPN” in your search engine and take a look at the results. The app’s homepage isn’t even mentioned in the first entries; instead, other providers that are ranked higher in the index show up, bragging about their “Anonymous VPN services.” See what I mean? After a rather lengthy exploratory journey on their website, we weren’t able to extract much on the company, other than the fact that it’s called Gate 100 Ltd and that’s pretty much it. We found on other websites that the company is based in Seychelles and that it was established back in 2015, but in their Terms of Service you can see that the company’s address is somewhere in Gibraltar. However, the fact that the company lacks any explicit details about their existence on their website isn’t necessarily an evil thing. Look at it this way: if they’re THIS protective with their data, then probably you will receive the same treatment. As its name clearly indicates, this VPN’s business is to keep your business private by making your identity anonymous from the prying eyes of whoever might be interested in revealing it. That’s a goal we can get behind. They even have a mascot called “DUDE,” and they claim that they’ll never disclose his real name. Kind of like how you’d prefer to be treated by VPN providers, right? Their website is quite simplistic, as they have a straight-to-the-point approach. 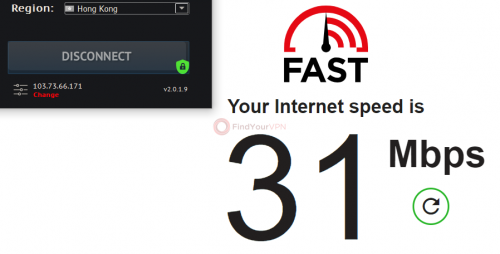 As soon as reaching their homepage you’ll be able to see the numerous claims on how your activity will never be logged while you’ll browse the Internet at a “blazing speed” using a VPN that even “Dude’s grandma can use it.” I guess we’ll just have to find out. As stated above, you can read a brief statement about their logging policy directly from the main page of their website, which states that no logs will be kept “what-so-ever.” A short explanation is also offered for the no-logs policy, claiming that, should government agencies come knocking at their door demanding logs of their users, they’d have to apologize and tell them they can’t help in this situation, since they don’t keep any logs. That’s good to know, especially seeing that more and more data sharing scandals surface every day and trusting anyone on the Internet, let alone VPN providers, has become an awfully delicate task. You’d think “what does this have to do with AnonymousVPN? Well, as stated above, some websites state that this VPN provider is based in Seychelles, which is not a member of the 14 Eyes Alliance. However, the “Terms of Service” page on their website mentions that the address of the company is somewhere in Gibraltar, which is a British Overseas Territory located on Spain’s south coast. Although it’s not a direct member of the 14 Eyes Alliance, it is possible that various government agencies can exert high enough pressure for them to crack and share whatever the inquirers came for. That being said, it’s a good thing no logs are kept since that data could’ve been easily put on a silver platter for whoever had the higher ground. We could let you do the hard work and get your hands dirty with Privacy Policies, but we know that it’s one of the things (Terms of Service, End User License Agreement, Licensing details, etc) that are never read by anyone, since users enjoy skipping them as fast as possible. But don’t worry, we’ll only extract the essential and give it back to you here. However, although AnonymousVPN doesn’t keep activity logs or browsing behavior and so on and so forth, they do keep a bunch of stuff, personal stuff, actually, that is often required to keep the service they provide in good shape or keep in touch with you. Let’s see just what’s on their list of stored data. Oh, I almost forgot, your acceptance of this data they collect to be logged is the fact that you sign up for an account. Fortunately, the amount of personal data they require to let you become eligible of using their service is kept at a minimum, your email address and payment information being the only bits of private information you’re going to share with them during the registration and payment processes. There’s also a guarantee that your data won’t be sold, traded or transferred to third parties unless they have a partnership going on. But even so, these trusted third-parties and their subcontractors are prohibited to use, share, or store this data for another purpose than the contract specifies or without your consent. Wait, this isn’t over, we’re past the personal data part, now it’s time to see what non-personal bits of data are they going to keep or access during your usage of their services. One example of such data would be the servers’ performance indicators which they monitor so that they can recommend the most suitable server to connect to, which varies from one user to another. You are informed that AnonymousVPN’s website might use various tools or third-party software such as Google Analytics in order to collect certain data that’s not personal and does not directly enable AnonymousVPN to identify you, and a bunch of examples are given. The AnonymousVPN services are transmitting data to secured servers, data bits which might contain your choice of the server’s location (where you choose to connect to), the time when you connected to their servers, and, of course, the amount of data that was transferred by you in one day (that includes incoming and outgoing, just so you know). Alright, so you know all the important stuff about this VPN service provider. Well, not all of it, but let’s just say that more than half of the ground has been covered with this information we just presented you. Now it’s time to register for an account since you can’t really use AnonymousVPN without an account. All you have to do is visit their website (the homepage would suffice), then scroll all the way down until you see a bunch of subscription plans on display. Select the one you’re interested in by clicking the “Buy Now” button, which will briefly redirect you to your shopping cart. From there, you’ll be able to see a total of the value of the services you want to purchase. After you check if this information is accurate (if you didn’t choose the wrong subscription plan), you can proceed to the next step by clicking the “Checkout” button. The next step requires you to type your email address and password in the designated fields and click the “Complete Order” button. The final step of this registration process is the one where you have to type your Credit Card details and actually let them process the payment. Once you’re done with that, the website will redirect you to your account page, where you’ll be able to see the status of your service for your account (hopefully “Active”). 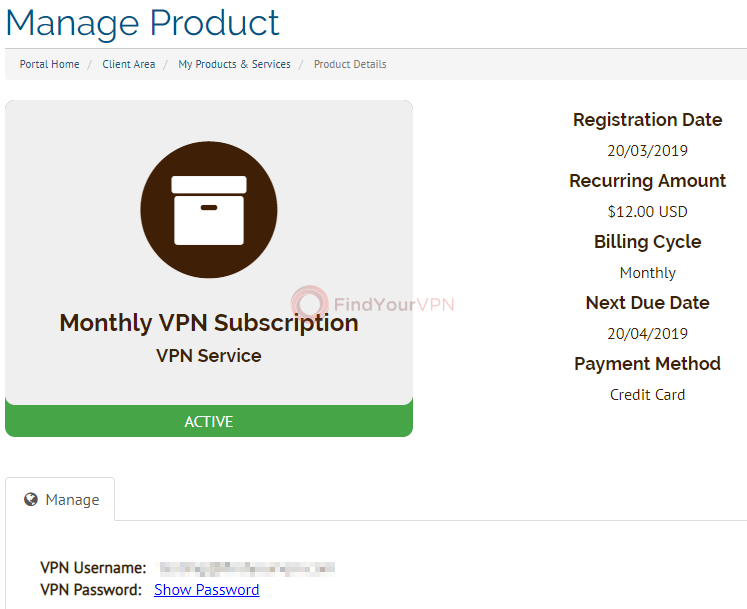 Immediately after purchasing the subscription plan you want, you’ll receive a couple of emails from the AnonymousVPN team, notifying you that your account has been created and that you can log into your account by using the provided credentials. However, you’re also told that the credentials in their email aren’t the ones you can use to sign into the app and after the completion of the full registration process, you’ll receive another email which will hold your VPN credentials. Pretty simple. The second email (the one with the VPN credentials) also packs a bunch of links that you can use to download the VPN application on various devices (Windows, Mac OS X, Android). Once you have registered for an account, you can now use the top-left “LOGIN” button on their website to access it. However, it’s not absolutely necessary to register for an account to download the app. You can do that by just scrolling all the way down once you reach their website. Somewhere near the bottom of the page, on the left side, you’ll notice a “Download our VPN client” text above a bunch of various icons. Clicking any of the icons will let you download the app on your device of choice (Windows, macOS or Android). Obviously, only the first two will actually download something to your device, pressing the Android icon redirects you to the Play Store page of the app. As we’ve discussed in previous reviews, we only describe how to install this application on a Windows-enabled computer, since we believe that it’s the most commonly used device in a household. And the most commonly-owned one, as well. Besides, setting up a VPN on a mobile device such as a smartphone is nothing short of a 2-step operation. You just click a button in the device’s store application, type your credentials and you’re all set! Not that the Windows procedure is far from there, you just have to run through a bunch of extra steps, such as accepting the End User License Agreement (the one that I’ve said before nobody reads), decide where to install it, if and where it should create shortcuts, as well as installing the OpenVPN TAP adapter (if you haven’t got it already). Throughout the installation you’ll be guided by the integrated wizard, so it’s really not a big deal. The version we installed is 2.0.1.9. Alright, so we’re all set up, we’ve got the app installed on our computer, now it’s time to run it. If you left the checkboxes in the setup window untouched, chances are the application has already been launched after the installation was completed. The main window encompasses a bunch of controls along a couple of fields where you need to input your credentials in order to access the application. You should keep in mind that if you’re unable to log in with the username/password combination you used to register the website account, try accessing the account area described above and click the green “Active” button on your screen. This should redirect you to the “Manage Product” section of the website, where, if you scroll down, you can see the VPN username and reveal the VPN password by clicking the “Show Password” hyperlink next to it. Or you can use the credentials provided in the registration email you received, it’s the same thing. Now that everything’s set and done, I assume you were able to log into the app using your VPN account and password from the website. As mentioned above, the main window is pretty minimalistic and the username/password fields are always editable (they don’t become locked after you logged in, nor they disappear), so you should watch what you’re doing with that mouse cursor and keyboard. If you provided the app with the correct combination of username and password, you can select the server you want to connect to and hit the large “Connect” button underneath the combo menu. The application is set to connect to the best server automatically, so if you want more control over the whole server location connection business, just open the dropdown menu and make a different selection. A very important feature that you simply don’t bump into while using other VPN services is the IP changer. If you feel the IP address you’ve been assigned just doesn’t cut it for you, simply click the red “Change” button and you’ll be provided with a new one. Pretty cool, right? In the same main window, you can notice there’s a button that looks like a bunch of bars with sliders over them. Clicking this button will extend the main window and let you access a whole other section that enables you to perform certain modifications to the program’s default state. The “Settings” section is not much more complicated than the app’s main screen since it only lets you perform a few adjustments. While this might be disappointing for advanced users who prefer a broader range of controls to be available for them to tinker with. If somehow, you downloaded the app and installed it without having created an account beforehand, there’s a shortcut you can use in the advanced view of the app that’s called, suggestively, “Create an Account.” Click away! 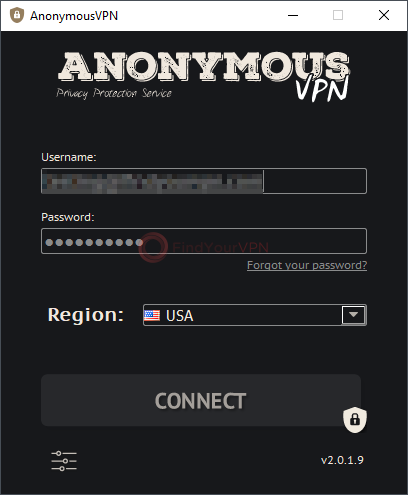 As stated before, there’s not really much you can change (only in terms of amount, because these changes truly are significant to the way you’re using AnonymousVPN). Settings include some general options such as enabling the app to be launched at system startup automatically, but also a bunch of more advanced ones. It is possible that you can change the default VPN protocol to be used every time you connect to AnonymousVPN from IPsec (AES-256 cipher) to OpenVPN (AES-256 cipher), toggle the kill switch and allow the local network connections. These don’t require any complex operations to be enabled, just selected from a dropdown menu or ticked in their designated checkboxes. That’s it. If you’re not familiar with the term, the kill switch is a security measure that automatically blocks all incoming and outgoing traffic whenever your connection to AnonymousVPN drops. 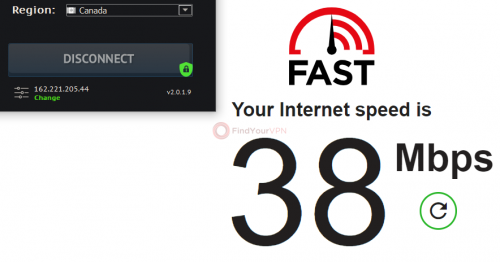 Your device is designed to check for the next best Internet connection and connect to it automatically and usually, this phenomenon occurs without you even noticing. For example, you’re downloading something via torrent and your VPN connection drops. 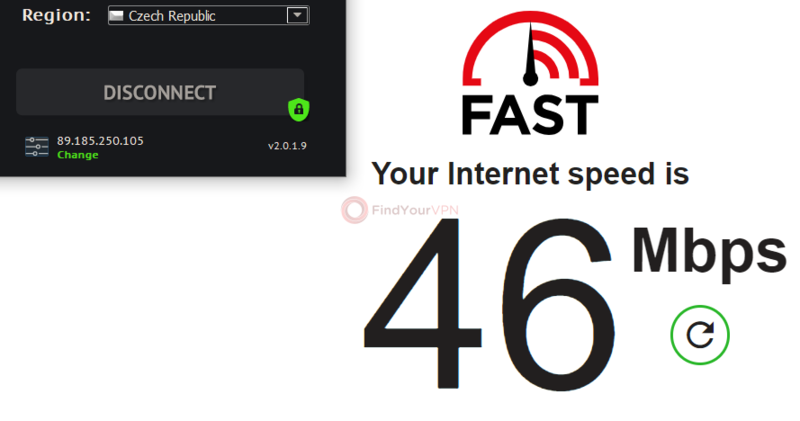 Your device automatically reverts to your default connection and a while later you check on your VPN app and notice that your connection is not active and probably has been that way for a long while. Although most torrent clients have implemented this feature, it isn’t the only situation where it can come in handy, so it’s better that AnonymousVPN has it to begin with. It’s quite important for a VPN service provider to enable their customers to connect to a broad range of servers, since some services are only available in certain countries, while others are banned entirely from other countries. See where I’m going with this? As you can see, not only do they provide you with the location of the server, you’re also offered some extra details, such as the server’s address and whether it supports P2P file sharing or not. As a matter of fact, currently they all feature support for P2P, so we’re good there. It’s not an impressive collection of servers since only 25 locations are covered in the whole, wide world. However, we respect the fact that the servers’ addresses have been added to the list. That way, if your country isn’t VPN-friendly, you can use the address to bypass this limitation and keep using their services without any significant efforts. This is a bit of information we believe every VPN service provider should include on their list of servers. Kudos for that! If you’re an avid VPN hunter like we are, you probably know that, if a VPN service is capable to unlock certain services that are either banned altogether in some countries or not entirely unlocked in others, it’s usually displayed in giant, flashy letters as close as possible to their homepage, if not directly on it. Unfortunately, services such as Netflix, Hulu, Amazon Prime Video, BBC iPlayer and the such can’t be unlocked by AnonymousVPN. Seems that, so far, anonymity is their greatest strength. But we have more to discuss and tests that wait to be done, so let’s keep our heads cool and not jump to conclusions. Many users are interested in keeping themselves anonymous whenever torrenting, so, naturally, judging by its name, AnonymousVPN seems to be one of the best choices we’ve got, right? Well, let’s see. We’ve already moved past the servers section and noticed that they’re all P2P-enabled, so I’m guessing that torrenting is not also supported, but also encouraged. Attempting to download and upload files through a torrent client went good, there were no spikes or connection drops. So, torrent away, people! I’ll begin by informing you that, if you’re looking for a live chat system, you should probably start looking in another place, since AnonymousVPN doesn’t provide you with such a service. If you want to reach their support team, you can simply do so by clicking the “Contact” button once you’re on their website, which will redirect you to a form page, where you have to fill in some data before you can submit the ticket/message. You have to type in a name, an email address (which you can check and see if they replied), a subject and a message. I don’t see any screenshot upload button, so I guess it’s not an available function, so you’ll have to be very explicit if your issue is a highly-specific one. You also need to type in a captcha so they can prevent bots and other forms of automated submissions. On the bright side, we received a response rather quickly and the support crew was, well, very supportive! We were offered more than we bargained for (the reply included some information we didn’t ask about), but that’s not a bad thing, is it? You can also follow or contact them on social media platforms if you’re the “real-time chat” kind of person. Although the lack of a live chat system might be discouraging for some, other users prefer not having to interact with another human being, to begin with, and rather fix the issues by themselves. If you fall into this category, you’ll be glad to know that they have an extensive (and growing) section of helpful articles that can get you up and running in no time. All you have to do is click the “FAQ” button at the top of their website and you’re there, the knowledge base, the holy grail of AnonymousVPN guides. Well, not exactly, but you know what I mean. You can access a FAQ that covers billing and VPN information but also browse through popular articles from this page. More so, if you have a specific question in mind, you can start typing it in the designated field and maybe an article addressing your issue will pop up. Enough chit-chat, we’ve reached the part where we must unfold our operation kit and perform those pesky tests to decide whether or not this service can be safely used or if it will sink to the bottom lightning-fast. 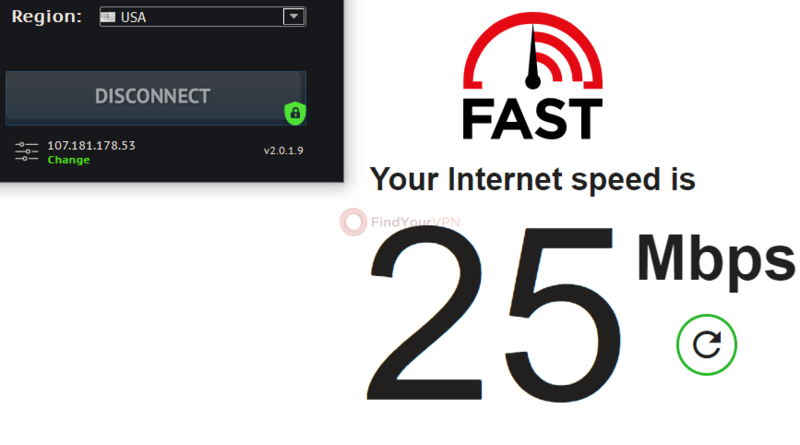 Then, and only after then, we’re going to run a speed test on Netflix’s fast.com website, since we’ve noticed it provides a result that’s more relevant than the traditional Ookla Speed Test. Although the Ookla service provides us with additional info such as ping, upload, and download speed values, we’re only interested in how FAST it can go, not all that technical info. It’s just easier to grasp. If you’re THAT impatient, feel free to access the results here and draw the conclusions for yourself. But if you’re interested in a good read, get cozy in your chair and follow the rest of the article (it won’t take long, I promise). 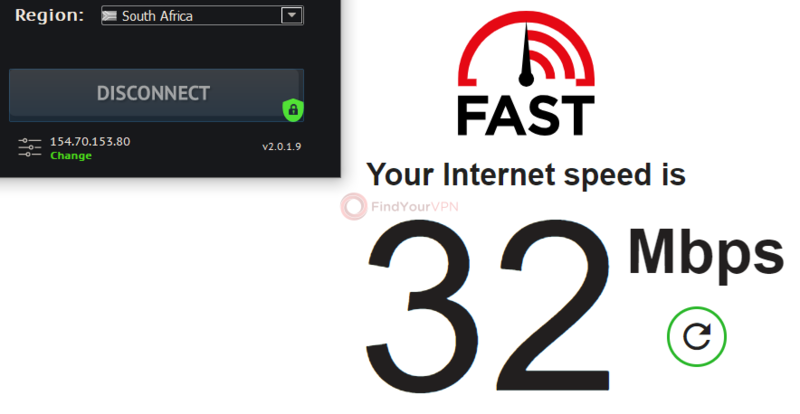 First of all, the IP address, PTR, country, city, latitude, and longitude have been successfully spoofed and set to display the parameters “borrowed” from the server we’ve connected to (we’ve double-checked in the main window of the app). So far so good. The ASN (Autonomous System Number), ISP, domain type and IP type were pointing to AS25512 CD-Telematika a.s., Josef Skoda, hicoria.com and respectively Non-Residential (Data Center). All is good here. The IPv6 geolocation wasn’t available, and the DNS section was literally overflowing with servers located in Belgium and the Netherlands. Finally, the WebRTC section displayed our local IP address in the Private (IPv4) section and the server’s IP address in the Public (IPv4) category, as it should. We are a bit surprised by the results. We actually had to double-check we were connected to the VPN service, to begin with, since some of the results were surprisingly high, while some others were a bit lower than the usual. But overall, the speed values are very good! I wanted to discuss about this with you from much earlier, but since the money talk never occurs until the end of the article, I just couldn’t. So here we go. Maybe you noticed the subtle “trial” touch on one of the plans there on the homepage. Well, as you expected, it’s not exactly a trial, since you have to pay for it and trials usually involve getting to TRY the product before putting your money on the table. Not exactly a cool move, AnonymousVPN. They also have a 14-days money-back guarantee, but it’s nowhere to be seen on the main page of their website. You have to find it in their site’s entrails by searching for it specifically. Once you reach it, you’ll notice that it only applies for the monthly and yearly subscriptions, so, again, the trial isn’t exactly a trial since you can’t even get your money back if you’re not satisfied with their services. Sounds pretty restrictive to me, but at least it’s there, right? So if you’re looking to get your money back, keep these rules in mind. A 1-year plan – 69$. As you can see, purchasing a yearly plan saves you a bunch of money. However, we can’t help but say that their services are quite pricey for what they have in store. More so, the trial isn’t a trial; it’s a 3-day plan. There. Also, you can’t pay with anything other than your Credit Card. To sum it all up, AnonymousVPN is a VPN service provider that’s located somewhere in Gibraltar, which is British Offshore Territory and, while it’s not officially a member of the 14 Eyes Alliance, various government agencies can pressure it into giving up data. However, their zero-logging policy claims that there’s no data to begin with since they only log a minimum of personal data and never monitor or store user-specific activities while connected to the VPN, so technically you’re safe. Unfortunately not a wide range of devices is supported, as you can only download and use the app on a Windows PC, macOS computer or Android phone. Also, it appears that the website password isn’t the same as the VPN one, so you have to perform a manual check on your account page after you register. It enables you to connect to servers from 25 locations, which is a quite narrow list, but at least it’s got an IP changer feature that enables you to change the IP you’ve been assigned by the VPN server in a jiffy. More so, the time it takes to connect to a server is very short, so that gives it an advantage. Security-wise, we detected no leaks, the whole system appears to be air-tight and speed-wise, we were pleasantly surprised to discover that some locations yielded higher speed values than the usual. Netflix, Hulu, Amazon Prime Video and the such can’t be unlocked, but at least you can torrent without a worry. Their customer support system doesn’t feature live chat but has a comprehensive knowledge base that can help you solve your issues by yourself and their support crew members are very helpful and reply in a timely manner. They claim to be offering a 3-day trial that you have to pay for and no, you can’t get your money back for it, so that makes it not-a-trial. The other two plans they offer are a bit pricey for what they offer, but at least they offer a generous discount for the yearly subscription. Their refund policy has quite a few restrictions and it only applies for the monthly and yearly subscriptions. We give AnonymousVPN a 2.76/5 rating.